Forbes recently selected “The Fastest Cars Under $50,000.” The 2013 Subaru WRX STI Special Edition made the list, but what surprising cars made the short list? Fans of Subaru will not be surprised to see the 2013 WRX STI Special Edition sedan on the list of Forbes “The Fastest Cars Under $50,000” that just came out. But some of the vehicles they put on their new list are a bit of a surprise. We would expect to see the Camaro SS, and Dodge Charger SRT8 on the top fastest cars list for under $50K, but they are also some interesting omissions. What about the Ford Mustang? Which cars, truck and SUV did Forbes put on their “The Fastest Cars Under $50,000” list? Forbes said they compiled data from Auto Trader and lead editor Brian Moody came up with the ten vehicles on their list. The Forbes editor evaluated 0-60 mph sprint times for all model-year 2013 vehicles, taking into consideration segment categories and style. While there may be some other cars that are faster, Forbes wanted a diverse group that covered many segments. They even included a truck and one SUV on the list to accurately show what people are looking for in a new car. The list is not just about speed, but of course also price. The second Ford Forbes chose is the 2013 Ford Flex EcoBoost crossover that is a big surprise on the list. The four-door crossover SUV has a surprisingly fast 0-60 sprint time, but most buyers wouldn’t be considering it for its performance. Other Fords that didn’t make the list were the 2013 Ford Mustang or the hot new 2014 Ford Fiesta ST that is leading the global market in compact performance cars sales. Another surprise was the one truck entry that Forbes chose, the 2013 Toyota Tundra Regular Cab 5.7L V8. While we don’t think of the Tundra as a fast truck, it certainly wasn’t the slowest vehicle that made the list. Hyundai made the list with the sporty 2013 Hyundai Genesis R-Spec 5.0 that has a very quick 0-60 sprint time. And with all their performance sedans, the German automakers only made the list with one vehicle, the 2013 Audi S4. The luxury compacts are the fastest growing performance segment around the globe. There is a three-way battle between Audi, BMW and Mercedes for who will be the top luxury brand. Subaru fans aren’t surprised to see the 2013 WRX STI Special Edition sedan on Forbes “The Fastest Cars Under $50,000” list, but what about some of the other cars they chose? Look at the list below and see the cars, truck and crossover with their price and 0-60 sprint time. 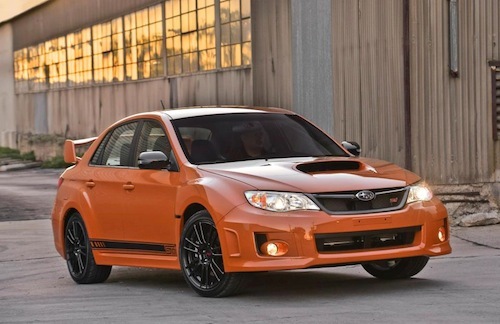 2013 Subaru WRX STI Special Edition Price: $34,795 Speed: 0-60 in 4.7 seconds. What they have had to consider in order to come up with the fastest cars under $50K was split time of Zero-60mph-Zero. Zero-60mph time alone doesn't mean much unless considered how FAST it stops. Braking power is something often gets less attention in many test reports but it is as important as the power to accelarate. With this regard some of the names of cars listed may be excluded.